Elizabeth Petrovna (Episodes 40 and 41) was born on December 29, 1708 as the daughter of Peter the Great and Catherine I. Her reign, from December 6, 1741 to January 5, 1762 was marked with enormous expenditures of money on the arts and architecture. 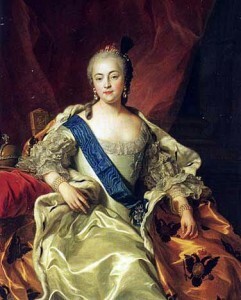 She was one of the most popular monarchs in Russia’s history in part because of her outlawing execution. 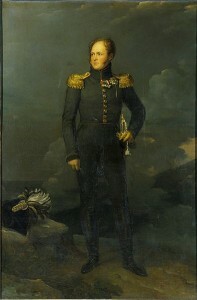 Her father, Peter I, was a towering figure. His legacy would cast a huge shadow on the people of Russia for centuries to come. To be the daughter of a legend must have been hard but Elizabeth was up to the challenge. She was betrothed to Prince Karl Augustus of Holstein-Gottorp, son of Christian Augustus, Prince of Eutin but he died a few days after the betrothral. She was never to marry and would have no children to succeed her. After her father died, her mother Catherine took over but her reign was brief, lasting only two years. After her death, her cousin, Peter II who was the son of Peter the Great’s brother Alexis assumed the throne. He lasted less than three years and with his death, Peter the Great’s niece, Anna Ioannovna took over as Empress of Russia from 1730 to 1740. Shortly before she died, she named her grandnephew Ivan VI as heir but the boy was a mere one-year old. 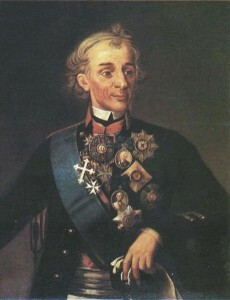 His mother, Anna Leopoldovna became regent but she was widely disliked because of her German advisers. Within two months he was overthrown by Elizabeth and her allies and locked away never to be heard of again. When guards tried to free him, he was murdered at the order of Catherine the Great. Assuming the throne as Empress on December 6, 1741, Elizabeth was to reign for twenty years. She was head of Russia during a trying time with the Seven Years War raging throughout Europe. Elizabeth and her policies were to have an enormous influence on the outcome of the war. Her domestic policies were solid as they continued with the ideas of Westernization started by her father. She knew that without a child, a succession issue would arise so Elizabeth selected her nephew, son of her sister Anna, Peter of Holstein-Gottorp as the next in line. Next up was a wife for him and after much debate she picked Princess Sophie of Anhalt-Zerbst who was christened Catherine when she converted to Orthodoxy. When Catherine gave birth to a son Paul, he was snatched from his mother and raised by Elizabeth. This cause a great deal of emotional distancing to take place between mother and son. 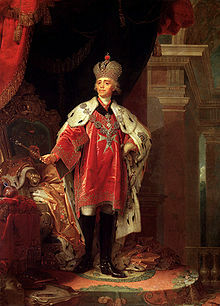 After Elizabeth died in 1762, Peter III was crowned Tsar but his reign would only last for six months before he was overthrown and killed by a coup that elevated his wife Catherine the Great to the throne. Elizabeth’s legacy is positive although unremarkable. While she cannot be rated as one of the best Russian rulers of all time, she certainly does not come close to being one of the worst. On this day in 1796, Catherine the Great (aka Catherine II) passed away in her commode (Episode 51) at the age of 67. She was considered, along with Peter the Great, as one of the greatest leaders of the Russian Empire. Her son Paul I was to take over and reign for a little over four years. Paul despised his mother and did much to reverse many of her policies. He put into law that only male heirs to the throne were eligible setting up the way for the decline of the Romanov dynasty. She was the wife of Peter III and upon his murder during a coup d’etat on July 16, 1762, she took control of the government. Born, Sophie Friederike Auguste von Anhalt-Zerbst-Dornburg, she was hand-picked by Empress Elizabeth (Episodes 40 and 41) the daughter of Peter the Great. The marriage was a disaster and likely was never consummated. Fearing that she would be sent to a nunnery and divorced, she decided along with her friends the Orlov brothers, to stage the overthrow. What helped her was the fact that Peter III was generally disliked and had sided with the Prussians during the wars going on at the time. The era of Catherine’s reign is generally considered the Golden Age of the Russian Empire although the vast majority of the people living in Russia at the time were incredibly impoverished. It was also the time of one of the greatest revolts in Russian history, the Pugachev Rebellion (Episode 47). Her time as Empress of all of Russia was a time of great expansion and a instilling more European style into Russian society. 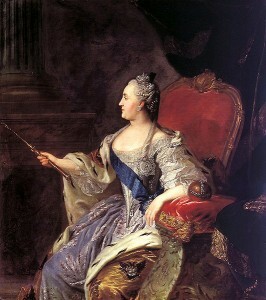 Catherine was one of the few Russian leaders (post Peter the Great) to have no direct heritage to previous rulers (Catherine I was the other). She was also a great patron of the arts and commissioned the building of the Smolny Institute the only school of higher learning for women in Russia.